No NASA Mars orbiter has been in a position to observe morning daylight on Mars since the twin Viking orbiters of the 1970s. 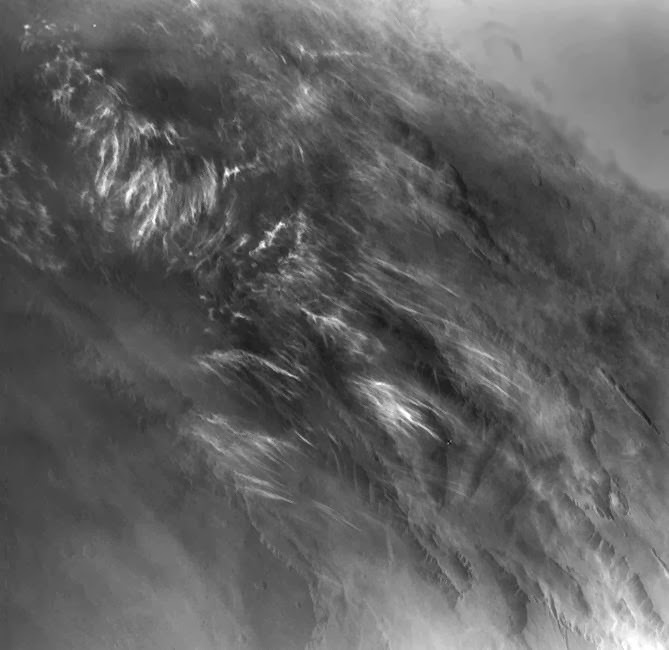 This image, taken by Viking Orbiter 1 on August 17, 1976, shows water-ice clouds in the Valles Marineris area of equatorial Mars during local morning time. North is to the upper left, and the scene is about 600 miles (about 1,000 kilometers) across. Although a few observations of Mars in morning daylight have come from the Viking orbiters and the European Space Agency's Mars Express orbiter, no mission has systematically studied how morning features such as clouds, fogs and surface frost develop in different Martian seasons in different parts of the planet. NASA's Mars Odyssey orbiter, in 2014, is in the process of changing its orbit to enable such systematic morning daylight observations. Note: For more information, see NASA Moves Longest-Serving Mars Spacecraft for New Observations.